Women in space photos from the Freaking News website. According to Wikipedia, Barbie, the world's most popular doll, was released with a space suit costume, in the 1965." She was the first and most stylish woman in space and came with various Astro Fashions. First mother and child in space. 2001 article on April Fool's Prank Store's website. Please visit my Women Astronauts gallery on Flickr. ‘Womanned’ missions to take flight. As reported by Cosmic Chronicles. Eileen Collins became an astronaut in 1991 and was the first woman to pilot the Space Shuttle in 1995. In 1999, Lt. Colonel Collins became the first woman to command a Space Shuttle mission. "There was my mom and I had a wife for a long time and now there is my fiancée. Eileen is in a long line of women who have given me orders." ~ Jeffrey S. Ashby, shuttle pilot regards flying under Eileen Collins' command. 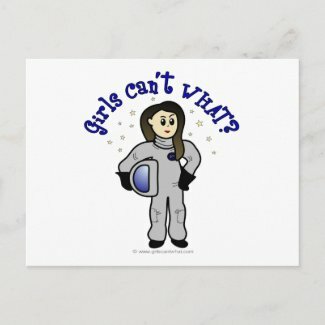 "My daughter just thinks that all moms fly the Space Shuttle." 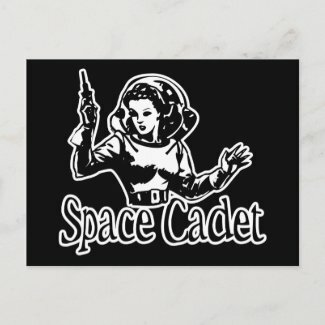 Click here for a Space-Girl tattoo. Click here for Space Girl and Robots tattoo. In 1965 Miss Astronaut Barbie and Mr Ken Astronaut were launched. In 2013 Mars Explorer Barbie launched. Her outfit is pink and white. Her spacesuit is unrealistically not bulky and she look unnaturally thin - no change from 1965. Click here to learn more.